This would have to be the healthiest chocolate brownie recipe I have ever seen. The list of ingredients is a far cry from the original brownie recipes, such as those served at Palmer House Chicago since 1893 or those in Fannie Farmer’s 1896 Boston Cooking-School Cook Book. The black beans give the brownie substance and the avocado makes for a smooth and buttery texture. 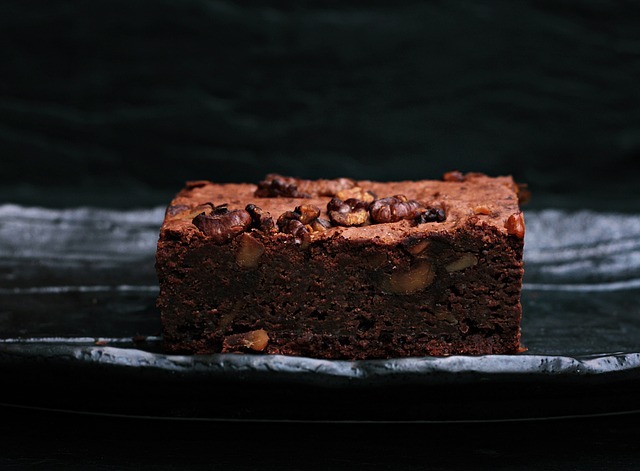 Throw in some dark chocolate and walnuts and there you have it – delicious, moist and rich brownies. Preheat oven to 180°C and line a 23cm x 33cm cake tin with baking paper. TIP: these brownies can be baked using a 12 muffin tray or use muffin papers. Add beans, avocado, sugar, cocoa powder, half the walnuts (1/4 cup), baking powder, vanilla extract, coconut oil, melted chocolate and the salt to a food processor. Process the ingredients in the food processor for 1-2 minutes. Chop the remaining walnuts and stir through the brownie mixture. Evenly spread the mixture into the the cake tin. Serve as is or warm with ice cream for dessert. Storage: store in the cupboard in an air tight container.